There are quite a few ways to heat food and water that require a flame. But did you know there are also flameless heaters? 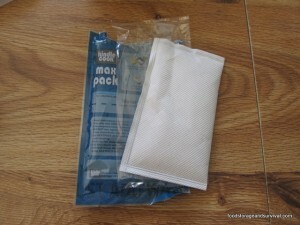 MRE’s have used this technology for years with their specially designed MRE heaters. 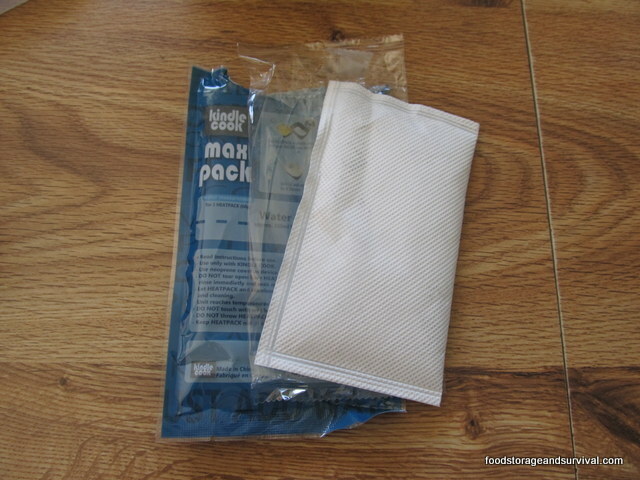 Those heaters consist of a chemical in a pouch that produces heat when it is exposed to water. 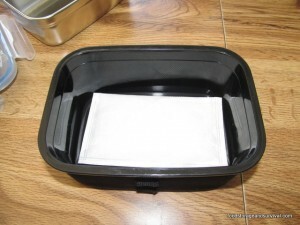 To use the heater, you add water to the pouch and then insert the sealed MRE and your food cooks with the heat produced by the chemical reaction. These are pretty slick. However, the design of them limits their use almost exclusively to MRE’s. Wouldn’t it be handy to have a way to heat other foods with this chemical reaction heat? 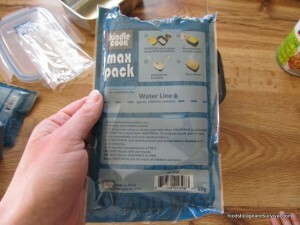 Enter the Kindle Cook Kit. This handy little cooker has taken the MRE heater technology and adapted it so you can use it to heat anything that can be placed in a pot. Water, freeze dried meals, soups, canned foods, etc. 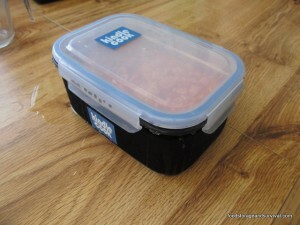 All it takes to make heat is a little bit of water, and the whole kit is safe to use indoors. 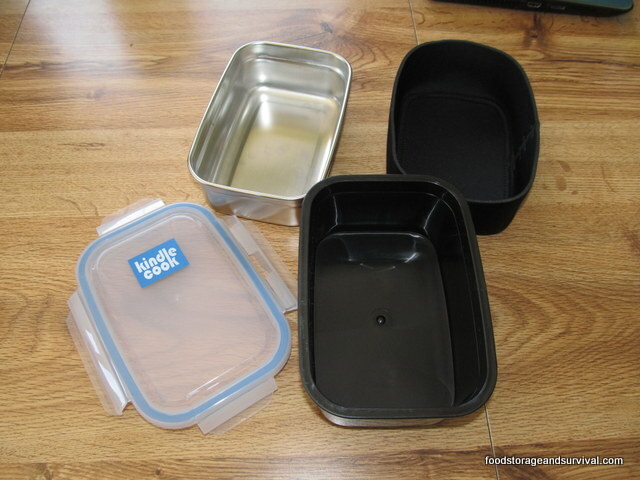 The Kindle Cook Kit consists of a stainless steel rectangular bowl, a slightly larger plastic bowl, a snap on lid, and a neoprene sleeve for the bowl. When ordered through Thrive Life, the kit also comes with two heater pouches. You can also order the heater pouches in a 12 pack. To use the kit, take the stainless steel bowl out of the plastic bowl. Put your food in the stainless bowl. 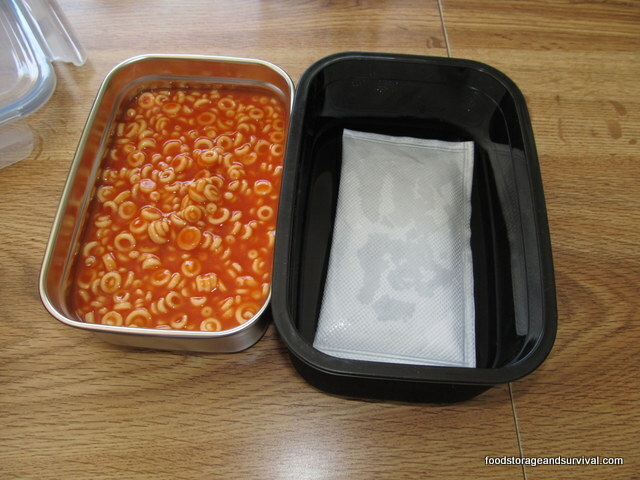 We’re testing it out on spaghettios. 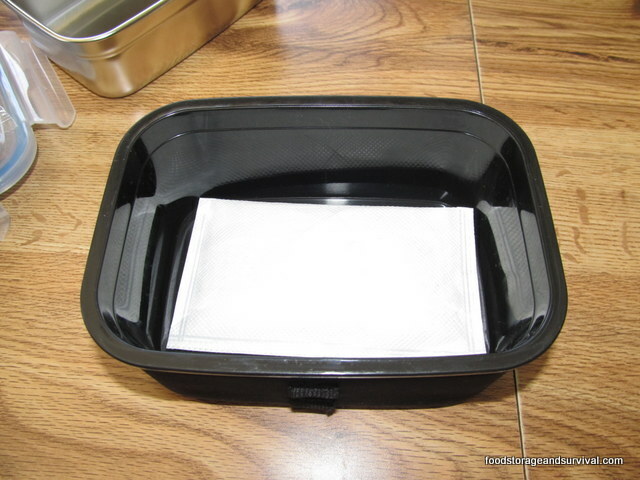 Open the plastic heater wrapper and put the heater pouch in the bottom of the plastic bowl. Do not cut the inner pouch open, just lay the whole thing in the bowl. Next, measure your water. The pouch has a line on it approximately where you need to fill it to. This does not have to be clean water–anything wet will work. I found the line to be just a bit too much water, but that may have been because I stared at the reaction too long! Pour the water over the pouch. It doesn’t look like it’s doing anything for a little bit, but don’t sit around staring at it like I did. Go ahead and put the stainless pot in and latch the lid on. If you wait too long, the heater pouch starts to expand and you have to compress it as you push the food bowl in which results in water spewing out the sides of the kit. Not a huge deal, but it did make a mess! Once the lid is snapped on, your food will heat up. It will take 8-12 minutes to heat the food. The heater is still heating longer than that–you may be able to dump the food into a bowl and heat a second batch before your heater cools off too much. While it is heating, the cooker can actually be held and moved if you avoid the steam venting at the corners. The neoprene sleeve makes it so the outside is cool enough to touch. This means it also won’t melt your tent floor or other synthetic fiber camping gear. Cool enough to hold while it’s steaming! The only drawbacks to this cooking method is that you don’t get to access your food while it is cooking so it’s not for making up a soup as you go. You also need to have a heater pack for each time you plan to use it which adds a bit to the bulk and expense of using it. Overall, a pretty neat product and a great option for times you want to warm your food up indoors (like during a rainstorm) or don’t want to make a fire but still want a hot meal. If you want something specifically for drinks, get the Kindle Cook Cup Kit which uses the same technology, but smaller heat packs to heat drinks or food in a thermos shaped cup. 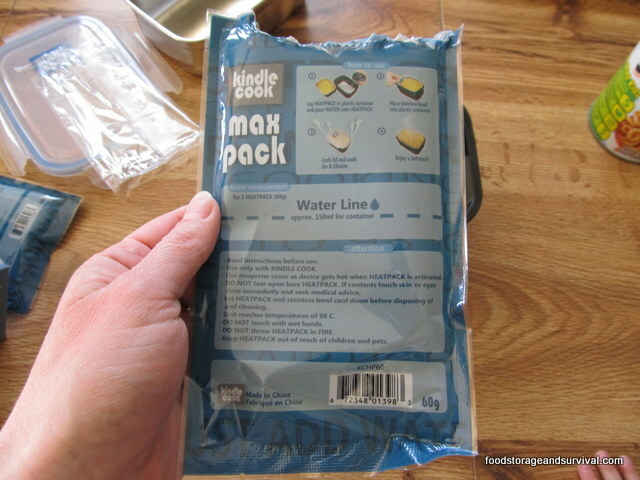 By the way, the Kindle Cook kit is manufactured in Canada, so if you get the instruction card the wrong direction you’ll be having flashbacks to high school French class and Mr. Jones (well, only if you were in French class at my high school). You may even remember enough to ask, “qu’est-ce que c’est?” If this happens, just flip the card over–it’s all English on the other side. Do you know who manufactures the Kindle Cook? 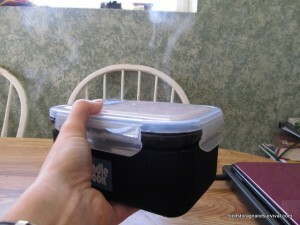 Barocook is the creator of and worldwide patent holder on this flameless technology. Kindle Cook has copied a mold for two products (a stove and a cafe cooker) from Barocook and created a knock-off copy in China. The product is far superior in design and function. 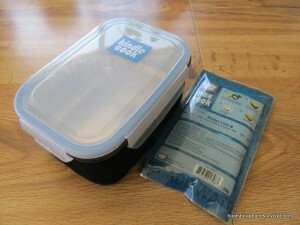 Because KindleCook is violating international patents and copyrights held by Barocook they are going through litigation. Customs agencies have begun informing and enforcing these violations. Inventories are being removed worldwide and retailers are running out of supply.